In this study, a comprehensive loss model using the most recent census data (2016) together with the updated earthquake catalog (till 2018) is employed to estimate the direct expected annualized loss of residential buildings in Tehran, Iran. This is an important parameter to determine insurance premium or to identify relative risk in a region. For this purpose, a fully probabilistic seismic loss model based on the stochastic event-based approach is adopted. The assessment includes the development of a robust approach to quantify the seismic hazard by taking into account dynamic soil response, compiling a high quality exposure of residential building and considering the most appropriate vulnerability models for different building classes. The result shows that average annual loss of building stock is around $0.331 billion which is about 0.29% of total exposed economic value. Also, the relative risk map of the region is presented in term of the annualized earthquake loss ratio. It demonstrates that the seismic risk in the middle and southern part of the city are much higher. In addition, a disaggregation analysis regarding the building typologies is performed to identify the most vulnerable building classes. The result indicates that the masonry and low quality steel and concrete structures with poor designing specification are the most vulnerable building classes. Majority of the buildings in southern part of Tehran are of these types, where accommodating low-income residents. The finding from this study can be used by local authorities, government and insurance sector in order to develop effective risk mitigation plans and a robust insurance scheme for Tehran, Iran. In addition, the presented approach can be applied in other cities with different socio-economic conditions. 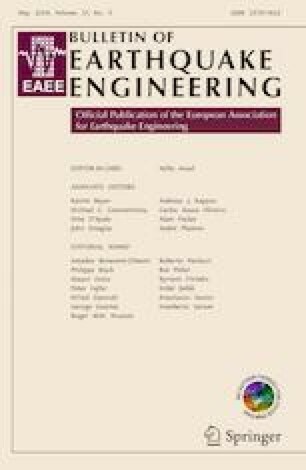 This study is conducted as part of a research program being implemented in the International Institute of Earthquake Engineering and Seismology (IIEES), Tehran, Iran. Its financial and technical supports are fully acknowledged. Additionally, the authors appreciate all those individuals and organizations contributing to the compiling data sets used in the present study, particularly Statistical Center of Iran (SCI) for providing the population databases.